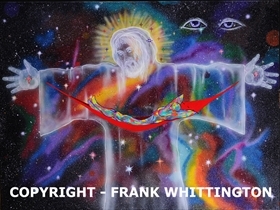 Frank Whittington has been given an awesome talent - prophetic painting. God speaks to him, shows him what to paint, and he puts it on a canvas. He minds the Lord and draws what God shows him during the services. 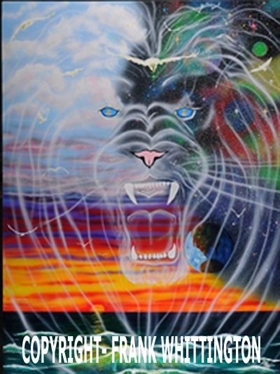 For more paintings or contact information, feel free to visit his website at www.painterofgodsheart.com or on Facebook. "The Truth" reflects what Christ did for us. It is textured and is meant to be felt to get the full impact of His Mercy and Grace. Are you resting in God? He's inviting you to rest in what he has finished. "Jesus is the Lion of the tribe of Judea and if we are in Christ then we also are from teh tribe of Judea. We have been given all authority in the name of Jesus. Everything in Heaven, on earth, and under the earth has to bow to the name of Jesus. The white eagles throughout the painting represent the prophetic. The prophetic voices speak forth the things of God."